For many of the world’s endangered species, it is too late. Either the gene pool is too small, or their habitat is so far gone that those bred in captivity can never be released back into the wild. There is one species of animal, which confronts both of these predicaments: the Orang-utan. Its habitat has been devastated by humanity. So much so that only two small viable pockets remain in the wild. In JUST HANGING ON, we travel to the island of Kalimantan in Indonesia, joining the world’s largest Orang-utan rehabilitation project to see first hand the battle they face trying to stop the extinction of this species. We also travel to what is left of the island’s pristine rain forest and see stunning pictures of totally wild Orang-utans in their natural habitat. 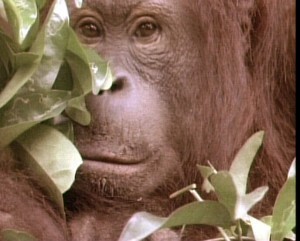 The documentary contains the only film available of a Borneo orang-utan giving birth. If you would like to jump to this video clip by itself click here: Birth of baby orang-utan. Otherwise, click on the screen below and enjoy watching Orang-utan – Just Hanging On. To find out more about the orang-utan click here. There used to be more species but there aren’t any longer.